Everyone who has ever played World of Warcraft has looked for ways to level their characters faster. There are plenty of leveling guides on the market today, and most of them employ a combination of mob grinding and quest completion, but that technique just isn’t the fastest way to level any more. Now that Blizzard has added the dungeon finder, WoW players of all levels can experience the dungeon system starting from level 15. The dungeon finder is a small, green button at the bottom of your interface. It’s toward the right side of the action bar at the bottom. It looks much like a green eye, and when you click on it, a dialogue box opens up and asks if you want to queue for a dungeon. Ninety percent of the time while you are dungeon leveling, you will choose to queue for a random dungeon. The only exception to this rule is when you have quests for a specific dungeon that you want to complete. Then you can select the dungeon from the drop-down box in the upper right corner of the dungeon finder box. The dungeon finder actually takes care of finding a group for you, and it uses players from all the servers in your server group. This means that you can still find a dungeon group if very few players are on your server at the moment. Each player who’s queuing for a dungeon will have to select a role. Some classes are DPS classes only, but other classes may be able to choose to be a tank or a healer. 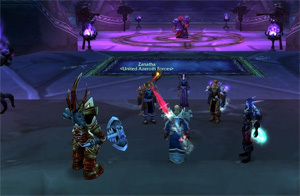 If you are new to World of Warcraft, then you will definitely want to choose the DPS role. People who have been playing WoW for a while can queue as tanks or healers because these two roles are very specific. Tanks must learn how to control the mobs and keep all of their attention on them. Healers must learn to focus on the tank and heal other party members as needed. Different dungeon leveling techniques are needed for players of all three roles. Tanks and healers will have very short waits, if any, so they may be able to go all the way to level 85 just through dungeon leveling. However, they will still want to travel the map a bit to pick up some flight points, especially those in all of the capital cities for their faction. The DPS classes will have a much longer wait time than tanks or healers. This is because so many players prefer to deal damage instead of having the responsibility of tanking or healing. DPS is known as a much easier role to play, so you have very few tanks and healers in relation to how many DPS you have. This longer wait time for the dungeon finder means that DPS players will want to work on solo quests while they are waiting for a dungeon. However, just remember to always keep the dungeon finder up and looking for a group while you quest.